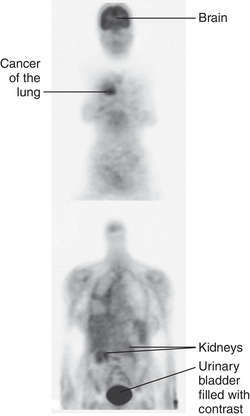 imaging anatomic information from a cross-sectional plane of the body, each image generated by a computer synthesis of x-ray transmission data obtained in many different directions in a given plane. Computed tomography in which cross-sectional scans are made of a bodily structure. adapted for analysis, storage and retrieval on a computer. clinical data is keyed in the examination room, the clinical pathology laboratory and the radiology section. It is then capable of analysis in terms of diagnosis, identity of the veterinarian, drugs used, inventory reset and accounts raised. Accounts can be made up and posted and a monthly statement of income and expenditure prepared. any method that produces images of single tissue planes. In conventional radiology, tomographic images (body-section radiographs) are produced by motion of the x-ray tube and film or by motion of the patient that blurs the image except in a single plane. In reconstruction tomography (CT and PET) the image is produced by a computer program. Called also laminagraphy, planigraphy, body-section technique. a revolutionary radiological imaging modality that uses computer processing to generate an image (CT scan) of the tissue density in a 'slice' about 0.5 inch thick through the patient's body. Called also computerized axial tomography (CAT) and computerized transaxial tomography (CTAT). Because CT is noninvasive and has high contrast resolution, it has replaced some radiographic procedures using contrast media. However, in some areas the injection of contrast further enhances the image. CT also has a better spatial resolution than scintillation imaging (about 1 mm for CT compared with 15 mm for a scintillation camera). 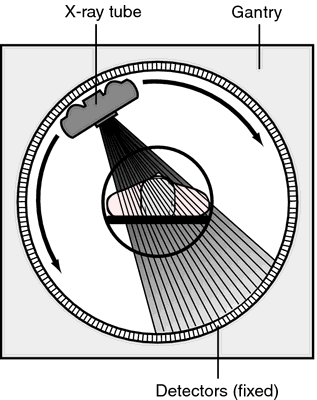 a combination of computed tomography and scintillation scanning. Natural biochemical substances or drugs tagged with a positron-emitting radioisotope are administered to the subject. After injection, the tagged substance (tracer) is localized in specific tissues like its natural analog. When the isotope decays, it emits a positron, which then annihilates with an electron of a nearby atom, producing two 511 keV gamma rays traveling in opposite directions 180° apart. When the gamma rays trigger a ring of detectors around the subject, the line between the detectors on which the decay occurred is stored in the computer. A computer program (reconstruction algorithm), like those used in computed tomography, produces an image of the distribution of the tracer in the plane of the detector ring. Most of the isotopes used in PET scanning have a half-life of only 2 to 10 minutes. Therefore, they must be produced by an on-site cyclotron and attached chemically to the tracer and used within minutes. Because of the expense of the scanner and cyclotron, PET is used only in research centers. the ultrasonographic visualization of a cross-section of a predetermined plane of the body; see B-mode ultrasonography. Provision for leasing without option of purchase of a Computerized Axial Tomography System Helicoidal Multicorte (16 cuts) destined to the Hospital of the East of Asturias, dependent of the Management of the Health Area VI-Arriondas. Other conventional imaging procedures such as X-Ray, Computerized Axial Tomography (CT), Diagnostic Ultrasound, or Magnetic Resonance Imaging (MRI) systems provide physicians with anatomical information. 1 computerized axial tomography, at the hospital of the city of castle. Contract notice: Provision of a computerized axial tomography (cat), towards the regional hospital of melilla. 1 computerized axial tomography plywood destined Operative Unit of Radiology of the Hospital of Treviso, won by Resolution of the General n.
1 Computerized Axial Tomography (TAC) comprising works related to radiation protection, installation, commissioning, maintenance service in warranty and after-sales service guarantee Clinic in Palermo. Other conventional imaging procedures such as X-Ray, Computerized Axial Tomography (CT), Diagnostic Ultrasound or Magnetic Resonance Imaging (MRI) systems provide physicians with anatomical information. Contract notice: Supply, with installation and works, a computerized axial tomography multidetector 128 layers to the unit operating radiology of the hospital john paul ii to olbia - sale, trade-in, tac 8 layers currently in use at the unit operational radiology of the hospital john paul ii of olbia. 1 computerized axial tomography multilayer (tcms) to be used operative unit of radiology of the hospital of treviso, convened by resolution of the general manager n.